Reliance to launch a 4G mobile phone in India? 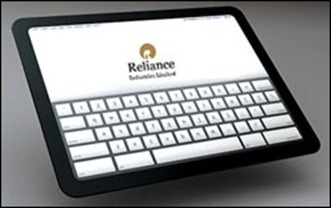 Reliance has plans to launch a 4G tablet in India this year. Close to fifteen Taiwanese manufacturers are ready to submit prototypes for the tablet which will be sold at a retail price of Rs. 8000. This is a little jumping the gun kind of news and is only expected from Reliance Industries. Many companies are still struggling to get started on the 3G services and Reliance is talking 4G. Reliance has money and muscle to lay out their network well in time and to procure as many tablets as it can to break-even. Voice by now is a commodity but, it still is a much needed commodity. A person buying a 4G tablet would want the calling and video conferencing capabilities on it. There are hardly any players on the 4G scene. Companies which might not have a problem are — Bharti and Aircel – which have licenses for 2G and 3G in select areas. Augere, Tikona and Qualcomm are other players in the 4G arena. Reliance along with BSNL/MTNL is the only company which has 4G spectrum in all 22 circles. Reliance along with Augere, Tikona and Qualcomm are the new players who don’t have 2G or 3G spectrum. Tablets is one thing and launching a phone is another thing. Reliance do not have license to operate in the 2G and 3G calls where most of the voice calls are based. 4G is a network which facilitates faster download speeds for internet and it facilitates voice calls too. That is where the whole thing gets messy, at least to me. If Reliance can launch a 4G tablet it can as well launch a 4G phone. It can collaborate with HTC to get HTC Thunderbolt to India. That’s a possibility. To get to that point, several questions have to be answered. Can Reliance Industries offer voice calls over 4G network? If Reliance is disallowed for voice calls, would there be demand for its 4G tablets? "Reliance to launch a 4G mobile phone in India? ", 5 out of 5 based on 1 ratings. Someone isn’t crying because of the rising vegetable prices! jaldi kro yaar mujhe lena he. when it will come to bhopal. EK Sim mere bhi le lena bhai. in india mobile service providers are struggling for 3g .some are provided and some are not ,those are provided this service they provided its only in metrocities or in urban areas.its means these are the only people who leave in india. my question is that why these companies are not providing this service in rular areas. i leave in rihand nagar, bijpur, sonebhadra,in the state of uttar pradesh. hear bsnl is the only 3g service provider. but its not cover the whole area of its. reliance, tata are not available hear.so, we are looking for the other 3g service providers like vodafone, idea,but they are very new in this field..and its take a to long time for provide 3g service in this area. how the india will grown?????????? when the whole world are looking for 4g service we are looking for 3g services….. Remember how Reliance entered the mobile market initially positioned as WLL (with free incoming and landline like numbers instead of the 10 digit mobile numbers) and then slowly moved onto mainstream mobile. With 4G devices they will offer high speed internet and if someone uses a Skype like application on the device and DOT cannot prevent them from doing so. Their license is for BWA so they cannot provide their subscribers with a phone number. wow! i’ve never heard of 4g before. .we have just got 3g and they are already moving onto 4g. nice info…advancement is always worthy…….